Detailing the physical features, habits, territorial reach and other identifying qualities of the Carolina Pine Sawyer. Carolina Pine Sawyer Beetles are found in evergreen forests, unaware they are carrying a tiny tree killer inside them. Carolina Pine Sawyers feed on the soft shoots of pine trees. While their feeding on this plant material can somewhat stress the tree, it is not the primary concern. Inside the Carolina Pine Sawyer's breathing pores are tiny nematodes, wormy creatures that leave the beetle and go directly into the chewed up wound of the pine shoot. Another mode of infection happens when adult female Carolina Pine Sawyers create holes in tree bark in which to lay fertilized eggs. The nematodes can enter the tree through these openings as well. Pine wood nematodes feed on phloem and xylem tissue. Xylem is the vascular tissue that transports water upward throughout the tree. Phloem transports nutrients up and down the tree. Destroying either tissue disrupts movement of necessary elements that keep a tree alive. Over time, these worms cause the leaves to wilt and the tree to dry up. This results in a slow tree death. 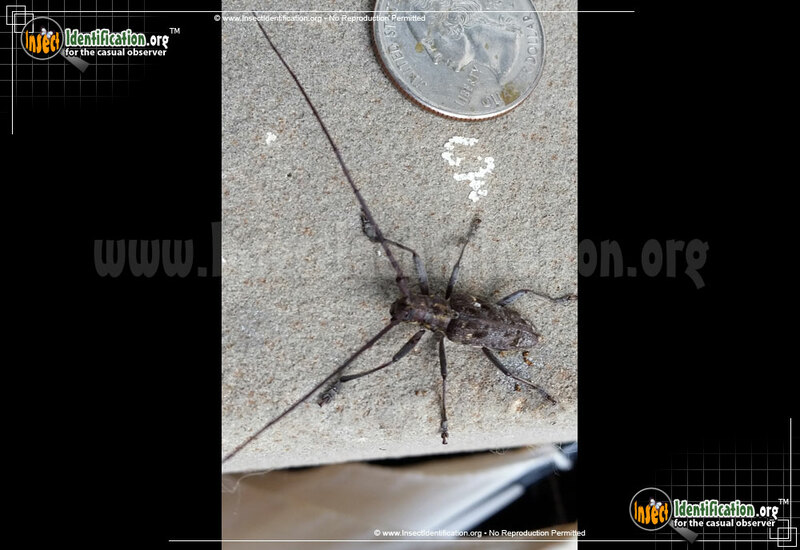 The Carolina Pine Sawyer is a long-horned beetle. Its antennae are longer than its entire body. The dark brown beetle has texture on its elytra (wing coverings). Small pits or dimples coupled with white and dark flecks of color make it look like rough tree bark. An obvious white spot near the head on each elytron flanks a white half-circle where the 'neck' meets the abdomen. It can fly, but many sightings are on tree trunks. Controlling the spread of the pine wood nematode requires identifying infected trees, cutting them down and immediately burning them. Because Carolina Pine Sawyer Beetles develop in about two months, its larvae and adult beetles may share the same tree. Seeing an adult on a trunk means the tree, though healthy in appearance, may already be infected with the nematodes. Storing infected wood or using it for flooring, pallets, and furniture allows the beetle larvae still alive inside it to emerge as infected adults in new areas. Incinerating or kiln-drying wood is the only definitive way to stop the nematode from reaching other trees. This unfortunately means the Carolina Pine Sawyer is a victim of circumstance.